Home FOOTBALL NEWS Sarawak vs Persebaya friendly to be televised live? Sarawak vs Persebaya friendly to be televised live? 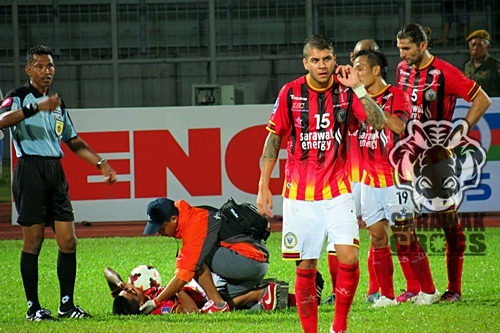 The friendly match between Sarawak and Persebaya Surabaya of Indonesia might be televised live over the Malaysian TV. This was an understanding by us, picked up from new portal Bola.net, which confirmed that Sarawak will play Persebaya during the coming month of Ramadhan. Sarawak have previously confirmed that they will be meeting Persebaya on July 23rd at Jatidiri Stadium earlier in the month. The news is interesting since Sarawak does not have its very own TV channel, and local Malaysian television channels are already much reluctant to show live games involving Sarawak at Stadium Negeri, what more to say friendly matches which are non-competitive in a foreign land. However, if the news is true, and that the game will be televised live, then Sarawak fans will be much thankful for the opportunity to see their side play the much supported Indonesian side. Previous articleSarawak wants the Malaysia Cup!